Do you have an insatiable need for speed? Well, if you do, you will definitely enjoy this brilliant racing game developed by none other than the renowned EA Games – Need for Speed: No Limits! Own cool-looking cars, tune them up, and drift your way to fame and victory against a multitude of computer-controlled racers and even against other human players. Do you have what it takes to be the ultimate racer in Need for Speed: No Limits? After an amazing game intro involving an exciting police chase cinematic, which also doubles as an interactive (and, no doubt, exciting) tutorial, you’ll end up in your own garage, buzzing with the desire to get yourself your own race car. Cars in this game cannot be immediately purchased using in-game currency. Instead, you’ll need to collect all the blueprints needed in order to first unlock a new car model. Of course, better cars will require more blueprints, and hence, will take a much longer time to obtain. Thankfully though, you can usually get more blueprints via the game’s daily freebie boxes at the loading docks or by completing certain campaign missions. Before you head into a race, you might check out how you can tune up your car... since you’re already at the garage and all. 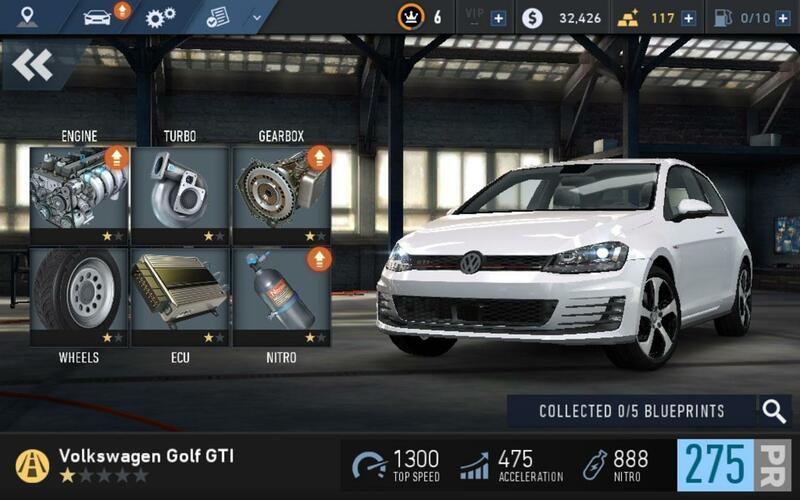 In Need for Speed: No Limits, each part of a car, be it the engine, the turbo, wheels, ECU, nitro, or the gearbox, can be upgraded twice (and subsequently, gain 2 stars). However, each upgrade can only be installed if you have the materials it needs, and of course, you’ll need to race to obtain these materials to tune up your car. Now, the racing aspect in Need for Speed: No Limits is perhaps one of the best that I’ve seen, and this is not at all surprising, especially considering that the Need for Speed franchise has been around for so long. 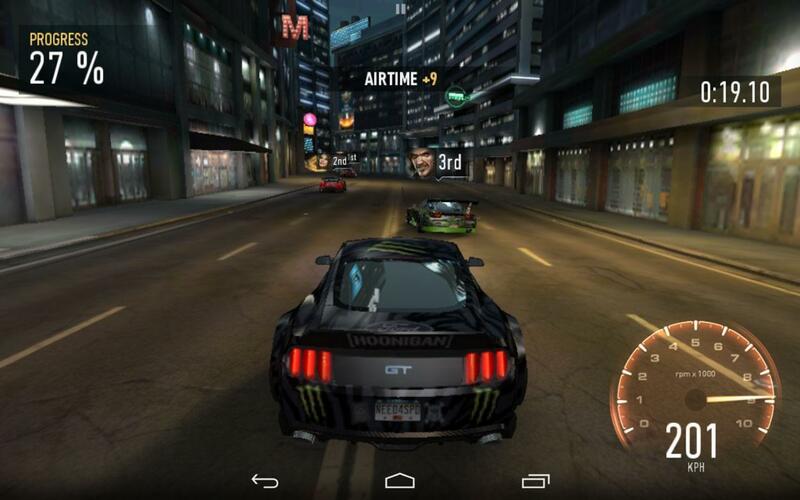 In this game, you’ll need to tap left or right to ‘drive’ your car, and you can drift by merely swiping downwards. Swiping upwards, on the other hand, will activate your nitrous. Nitrous will slowly refill itself as you race, but you could speed up the refilling process by getting airtime (by launching your car off ramps, for example) and by drifting. Of course, prior to most races, you’ll be required to press the pedal to rev up your engines. Be careful though! You’ll need to keep the needle in the green zone or your car will suffer a rather huge penalty once the lights turned green. Furthermore, the variety of races Need for Speed: No Limits provides is simply astonishing. Some of the race modes include Time Trials, Rush Hour, Hunter, Delivery, Nitro Rush and even Airborne, where you’ll be competing with an AI in a race track that is jam-packed with ramps. Although each race mode provides a different racing experience, one of the most exhilarating race modes in this game is definitely the Nitro Rush. In this game mode, you’ll need to keep spamming your nitro at the correct parts of the race track while doing your best to keep your high-speed race car under control. It’s not only challenging, but also wildly fun. Each race will cost you fuel though, and once it’s depleted, you can wait for your fuel to regenerate or you could also shell over some premium cash to buy more. As you earn more reputation from your wins, you’ll unlock new features in the game, such as tournaments where you can race against other players, tuner trials in which you can earn more blueprints, car series where you’ll be racing using the car you are assigned and also special events that EA organizes rather frequently. 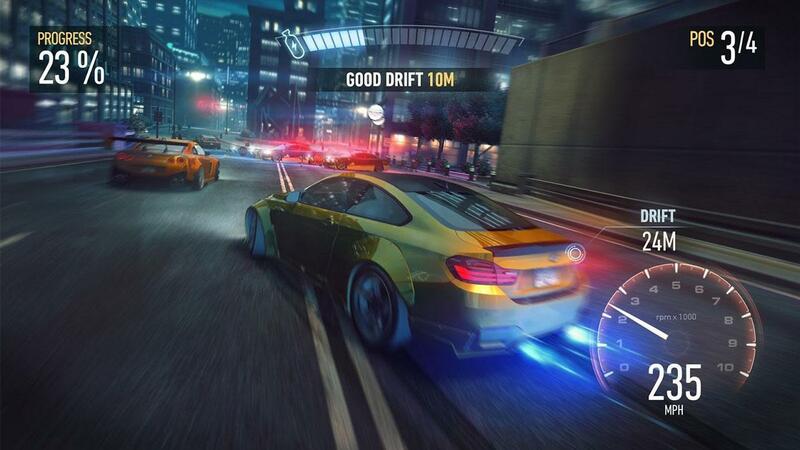 Need for Speed: No Limits is definitely among the best racing games there is for the mobile platform due to its amazing race variety, fun gameplay and smooth racing controls. If you’re a huge fan of racing games, you really should give this game a chance. I assure you, you won’t regret it!